Orlando Pirates head coach Milutin 'Micho' Sredojevic admits he was disappointed with his side's performances at home so far this season. Despite sitting pretty at the top of the Premiership standings, Micho has concerns about the fact that they have drawn four and lost one of their six home games so far this campaign. His comments come in the wake of a dull and disappointing 0-0 draw with Maritzburg United in Soweto over the weekend. "We did not get what we wanted to use this match as a preparation for the return leg in Seychelles and in the Telkom Knockout," he said. "We did not succeed. We need to go back because when it happens the first time, you say it is an accident. The second time, coincidence. But this is our fourth draw at home. We need to be self-critical and look at ourself where is the problem." The result leaves them just a single point ahead of Bidvest Wits, who have two games in hand and could easily usurp them at the top of the table. 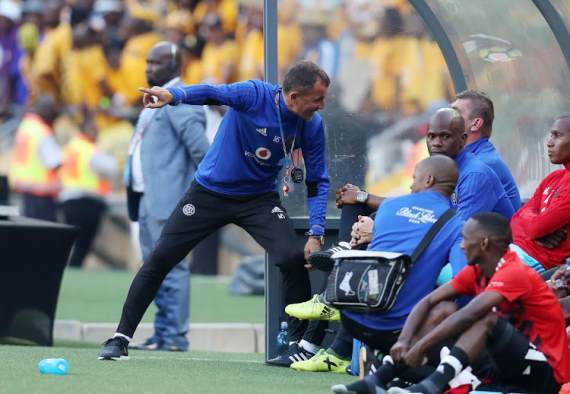 The trouble, Micho points out, is not the creation of chances but making the most of their dominance in matches and converting the numerous chances that are created. "Why are we not converting what we are creating? Why are we having four draws and always in those draws we are dominating teams? Those are eight points dropped, two out of four. And this is something we need to look at critically as the second round comes because the last match we are playing against Free State Stars. "We need to use Orlando stadium as a fortress where it is hard to come and hard to survive not being beaten," he concluded.